Caribbean rarely introduce entirely new models, concentrating instead on approaching perfection in the existing designs. Local agents Mansfield Marine, the managing partners both being shipwrights, have been responsible for many of the improvements. 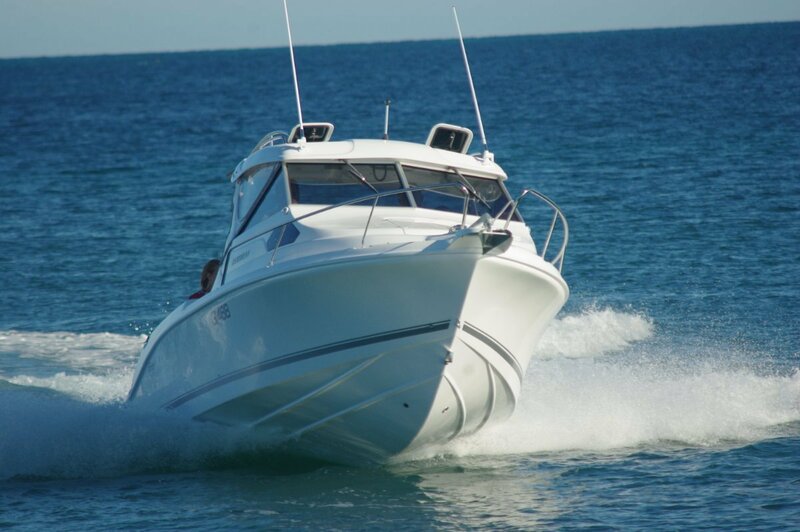 The Caribbean 2400 is a revered model, widely regarded as one of the best trailable offshore fishers available. What Mansfield leaves strictly alone is the vessel’s structure: Caribbeans are renowned for their consistency of construction. Hand laid, all the materials are weighed before being laid up. The hulls then stay longer in the moulds than at most builders, ensuring a thorough cure. The buyer of the reviewed 2400 is perhaps typical. 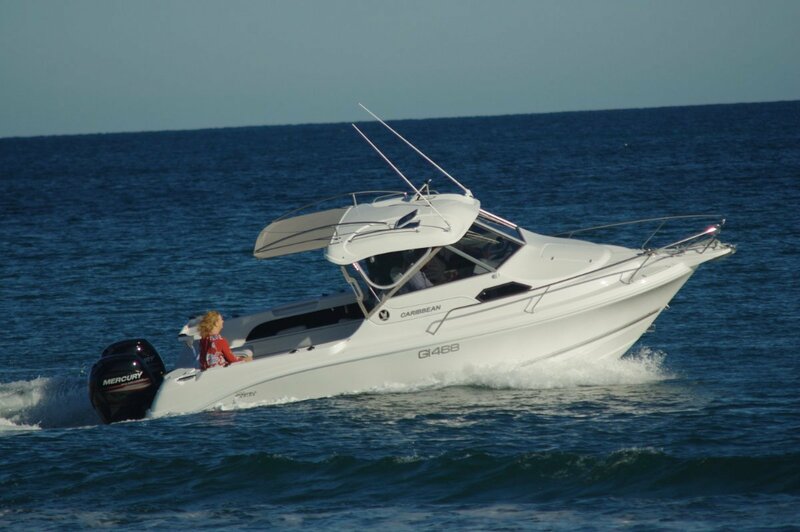 An enthusiastic fisherman he fishes wide – up to 40 miles offshore – and had been feeling a touch insecure in his smaller aluminium craft. He wanted a more substantial platform for him and his family; one that was capable of speed when returning with a developed sea breeze. The 2400’s size and form has delivered these qualities and allowed him to incorporate a lot of desirable extras. 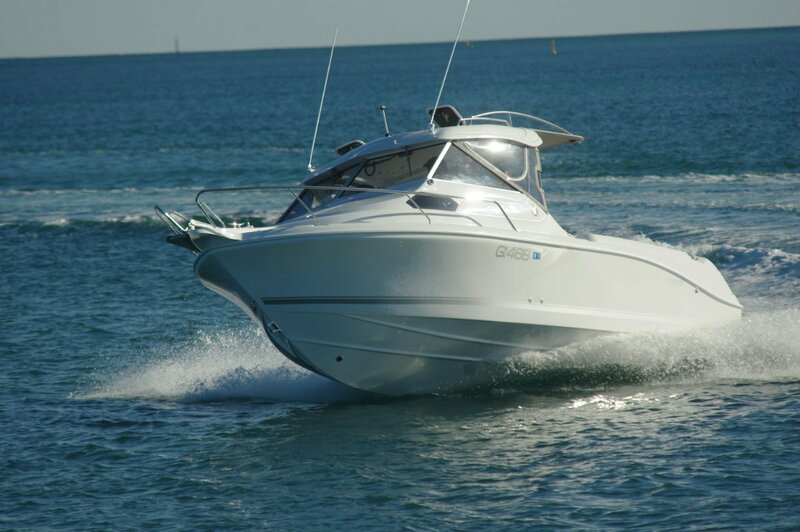 7.32 metres is a large boat by most people’s standards, capable of holding a great deal. The 2400 does just this, but much of it is hidden. Under the deck are vast capacity holding tanks with circulating pumps. Another concealed feature is a competent galley, less the actual cooking component, revealed by tilting the main seats forwards. This is not a live aboard boat, but comfortable enough for the occasional night at sea. The fore cabin, closed by a sliding door, has full size V-berths and a flushing toilet. More plumbing at the rear of the cockpit provides a fresh water shower. With extra guests aboard there is plenty of space on the cockpit deck to roll out swags. There is a lot of water below you 60 miles offshore, enough to remove the pleasure of reeling in a big catch. 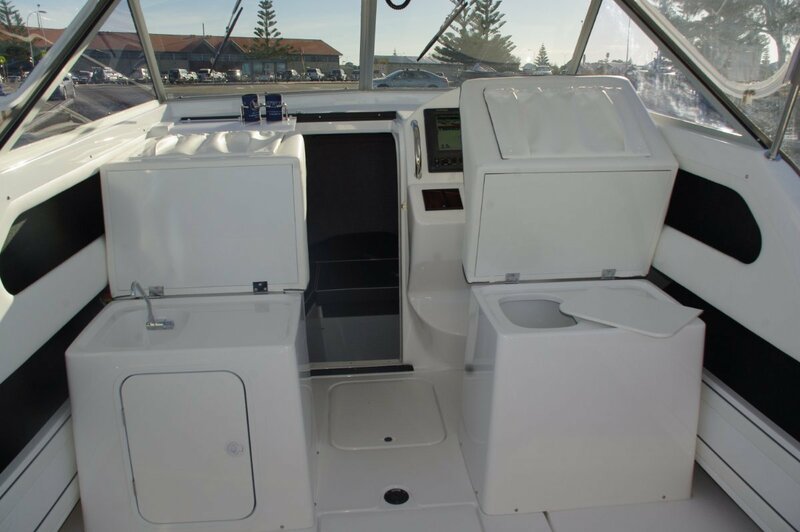 Mansfield installed side deck sockets and plugs for electric reels to remove the pain and retain the pleasure. The fish stand little chance; besides this technology there is around $15,000 worth of electronics largely devoted to finding them. There is a prince of bait stations at the transom which could be switched for a barbecue if it took an owner’s fancy, although fripperies like hot food take a distant second to fishing with this owner. The driver of this boat is a cosseted person. The seat is roomy with just the right resilience, facing a broad and deep foot rest. The cabin door is offset to port to maximize the area available for the abundant electronics and monitors. The wheel is a beefy stainless item with the extra that improves all wheels: a knob. Alongside is an oddments bin, matching the one by the navigator. At a lower level side pockets of great capacity stretch right aft. The driving position is protected by a hardtop pierced by two opening skylights, a full height windscreen – equipped with screen wipers – and side glass. Being solid the top is able to contain the radio and carry aerials and grab rails. The latter are necessary for using the narrow side decks to reach the foredeck. Narrow because the spread of dash uses up most of the wide beam of 2.69 metres. The dealer and the owner’s family all took part in the acceptance trials which were essentially a formality. Ride, handling, response to trim and outright performance were all on the mark; definitely a vessel to take wide. The 2400 was powered by a pair of 150hp Mercuries with the three litre block, the owner preferring the security this redundancy brings to the efficiency of a larger single. Fuel consumption is around 50 litres per hour at 25 knots – the likely cruising speed in most conditions – so the 467 litre tank is good for well over 200 miles.